One of the biggest concerns for adventurers new to hammock camping is “how do I stay dry in the rain”. Fortunately, you have a vast selection of tarps and riggings that you can choose from that will suit any weather condition. With the right equipment, you won’t have to worry about rain or snow. A wide variety of tarps exist for your camping hammock. They range from a simple roof over your head to a complete weather-proof fortresses. 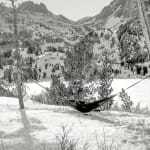 Almost all hammock rain-flies consist of a tarp with a ridge-line running through the center. The ends of the tarp are then tied down with guy lines. Keeping a tarp tight is important to providing maximum coverage. Not to mention it prevents rainwater from pooling in a single location. Choosing the right tarp is based on both personal preference and weather conditions. You’ll want to strike the right balance between weight, rain coverage and wind coverage. 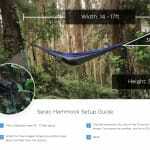 You’ll want to have adequate coverage for your hammock. This means looking for a tarp that extends about 8-12 inches past the ends of your hammock. It’s important that the ends of your hammock stay dry. If the ends get wet, water can seep to the body of the hammock throughout the night. A 12ft long tarp typically provides enough coverage for most backpacking hammocks. When it comes to tarp size, you’ll want to consider a few factors. A large tarp is great for complete coverage in a nasty storm. But this comes with extra weight, and limited ventilation. Limited ventilation can also lead to condensation in your hammock overnight. You might wake up finding yourself damp and covered in sweat. If you’re expecting a lighter shower, a smaller tarp might be the best choice. A smaller tarp would be lighter and allows for more airflow. 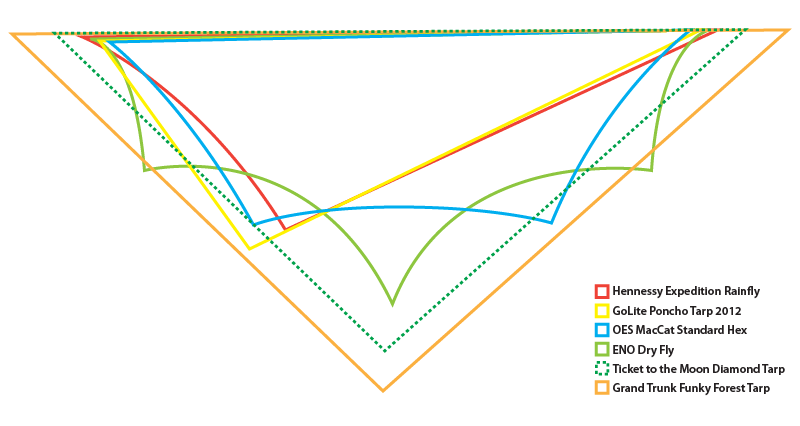 Tarps commonly come in rectangular, hexagonal, catenary or diamond (square) shapes. Different shapes will provide you different coverage. They’ll also have different amounts of anchor points which will affect your ease of set up. 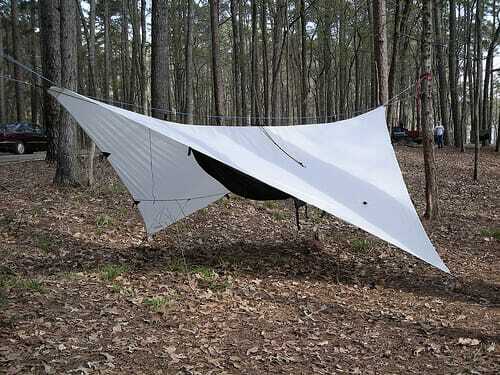 Rectangular Tarp: Rectangular tarps are set up parallel to your hammock. There are 4 anchor points for this type of tarps. A ridgeline is set up above the hammock. The tarp is draped lengthwise on the ridgeline. The 4 anchors are then staked to the ground. 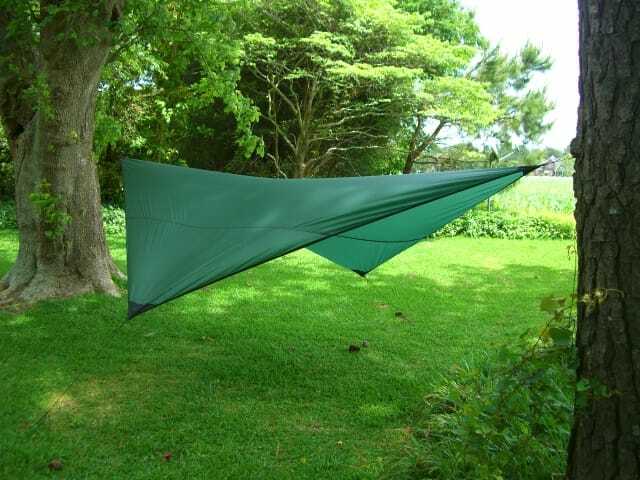 This type of tarp provides excellent coverage of the hammock and the ends. Because of the extra coverage, ventilation will be limited. 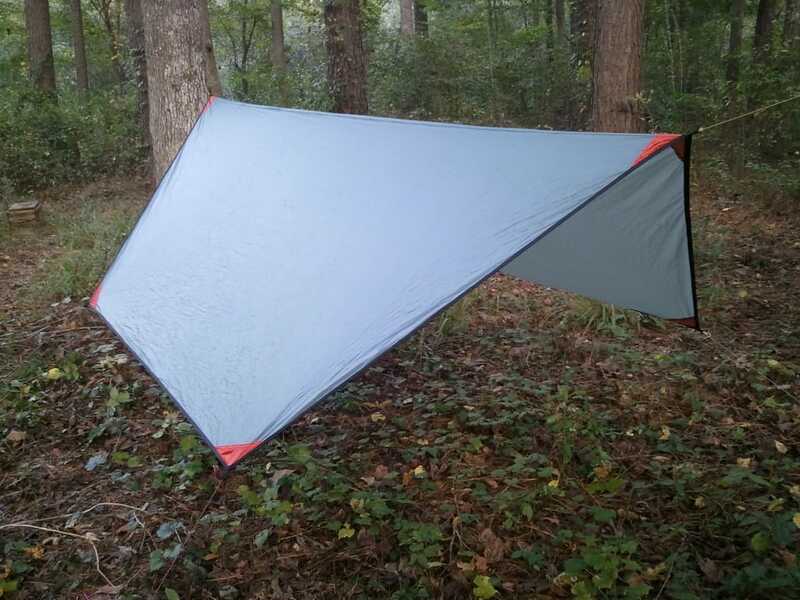 If these look similar to the ultralight tarp shelters used by some backpackers, it’s because they are functionally the same, with the exception that a hammock is placed underneath. Hexagonal tarp: Hexagonal tarps are similar to rectangular tarps. The difference is the corners are angled inwards. This requires less material to construct, which means you have a lighter tarp. Ventilation is improved for this type of tarp. Unfortunately, you’ll find that generally, these are more expensive than rectangular tarps. Catenary Tarp: Catenary Tarps are designed with special curved cuts to further reduce the weight of a hexagonal tarp. The sides of the hex tarp is cut at a curve to reduce the material used. This also prevents the tarp from sagging and flapping in the wind. This style of rainfly is one of the most versatile. It provides more than sufficient coverage for any hammocker, but the catenary cut ensures that the material is used efficiently and cuts down on weight. Another advantage is that catenary cut tarps are more effective without a ridgeline. The attachment ropes can be tightened and the shape creates sufficient tension to form a pseudo ridgeline without having to actually tie a length of rope as support. Diamond or Square Tarp: These tarps provide the least amount of coverage. Especially end coverage. 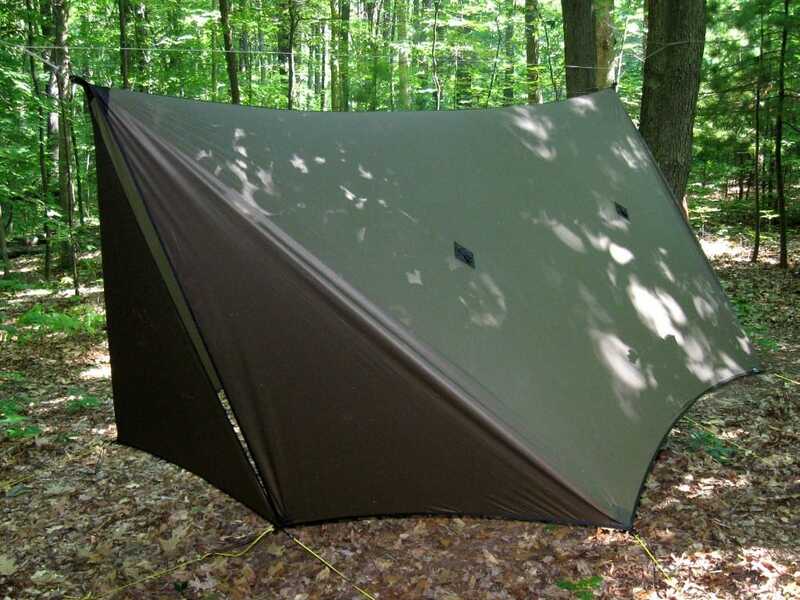 The benefits to this tarp are the ease of setup and the weight. Square tarps only have 2 anchor points, so it’s quicker to pitch than most tarps. Knowing the conditions you will be camping in is also helpful when selecting the right tarp. There are tarps available that are full coverage, with extra material that act as doors. 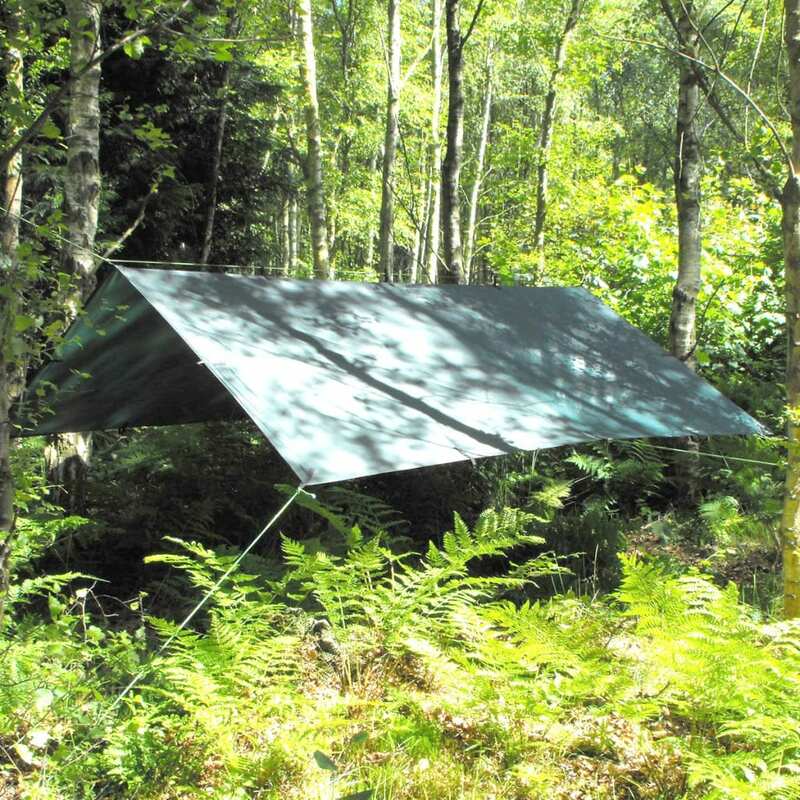 These types of tarps create a shelter that is almost akin to a floating tent surrounding your hammock and are best used in heavy storms or winter trips. Not only do they provide excellent protection from rain and snow, the encompassing shelter will also serve as an effective windshield and trap more heat. The downside for these shelters are that they are much more costly and heavy, usually with more pieces to carry with you for a proper setup. While these tarps come in the various shapes mentioned above, as long as you select a tarp that extends roughly 8 to 12 inches ahead of each end of the hammock from where the tarp attaches to the ridge-line, you’ll have plenty of coverage for basically any hammock. A simple blue polyethylene tarp you find at the hardware store can be a versatile shelter. They are the cheapest option and are very durable. You can usually pick one out that’s the right size for under $10. 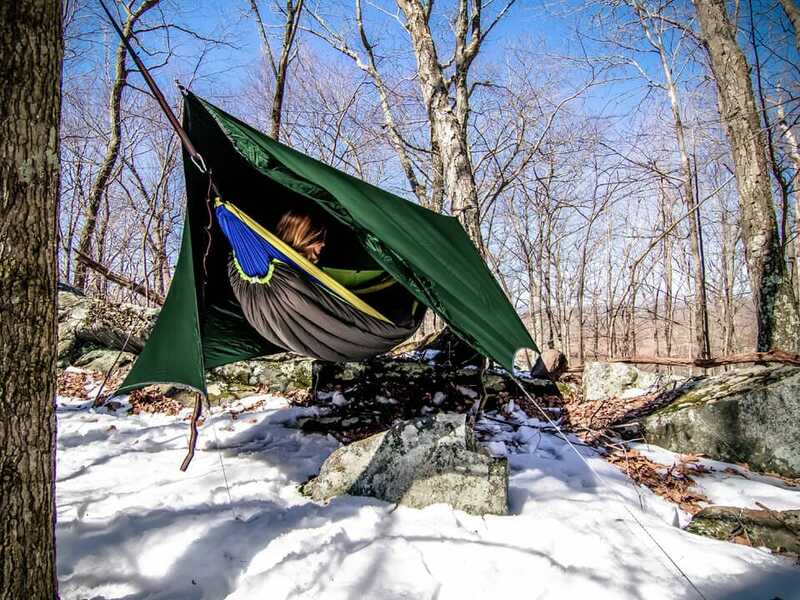 The simple blue tarp is also extremely versatile outside of hammock camping. With some creative staking, there are hundreds of different shelters you can build with a simple plastic tarp. But these tarps are also heavy and can take up a lot of space in your pack. Which is not a huge problem if you’re car camping. But when you’re backpacking, you probably do your best to save space and weight. These heavy tarps also make a lot of noise. If you’ve ever had to fold one of these, the unmistakable crinkling is rather loud. While not a problem for some, you might have trouble catching z’s during a storm. Silnylon tarps are popular with the ultralight backpacking crowd. While much more expensive than the basic plastic tarp, this material is very strong for how light it is. Plus it’s extremely waterproof. A silnylon tarp will cut down significantly on the weight and space. Many of these tarps exist as standalone shelters. They’re designed for ultralight backpackers who can throw one up and sleep directly on the ground. These work just as well as rain-flies designed specifically for hammock use. The major downside is that silnylon is easily punctured and wears out much faster than regular nylon. The first thing you’ll need for your rainfly is a ridgeline. This is a piece of rope or cord that’s tied tightly above your hammock. Your tarp or rainfly will sit on top of the ridgeline to prevent the tarp from sagging. Some people tie a ridgeline directly on the hammock suspension. They’ll find the ridgeline tight when setup. But when they get into the hammock, the ridgeline comes closer together. This causes the tarp to also sag – reducing the coverage you have. I’d recommend tying the ridgeline directly on the tree, independent from the hammock itself. This way the ridgelines maintains its structure when you get in and out of the hammock. You’ll also be able to set the tarp up first before you take the rest of your gear out. So you’ll stay dry when setting up the rest of camp! After the ridgeline is in place, you’ll want to set up the tarp. To keep the tarp in place, use guylines and stakes to tie down the corners of the tarp. 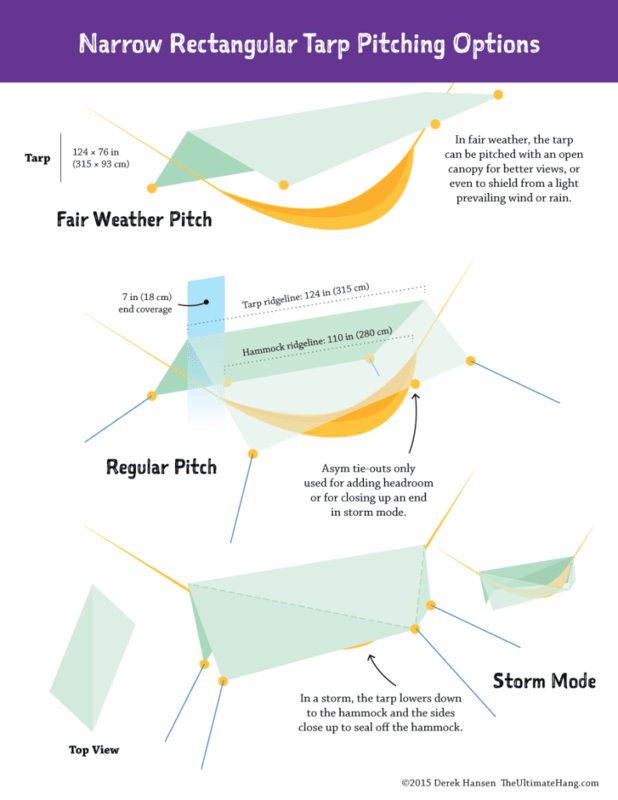 For windier and stormier nights, you can angle the tarp closer to you for more protection. If you’re just using the tarp as some shade or light protection, you can even use trekking poles to prop up your tarp. 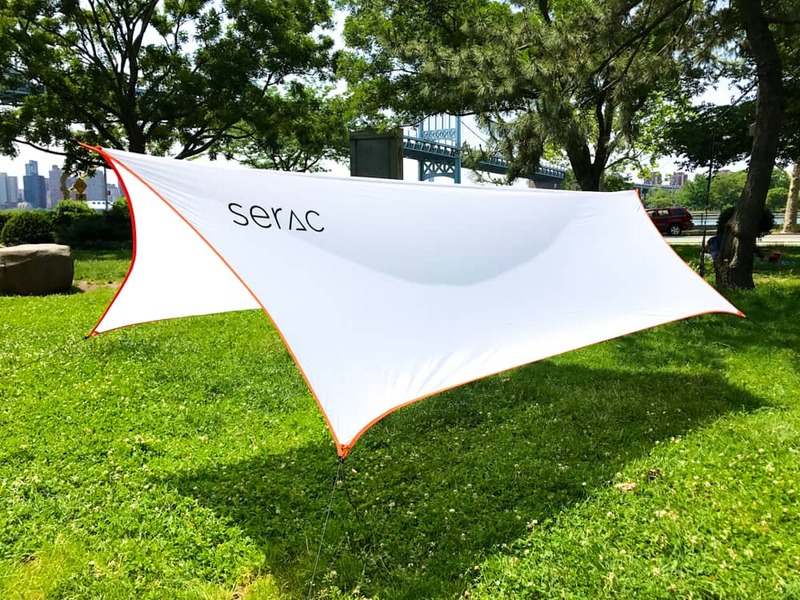 Some tarps, such as the Serac Overhang do not require a ridgeline. 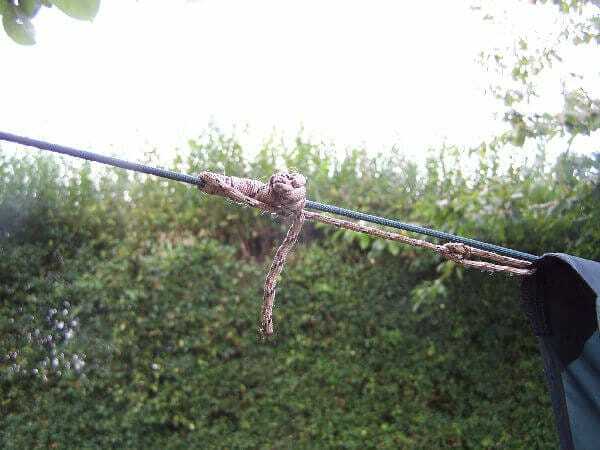 The design allows the cords at both to be fastened onto a tree and then tightened with the line-locs to achieve enough tension to support the tarp without any sagging. Here’s a step by step video covering tarp setup. When setting a rain-fly, it’s also important to tie a small piece of string onto your hammock’s rope. Water from the straps will flow down towards the lowest point. That means throughout the night, you’ll still get wet! You want to make sure that before it reaches the hammock (the lowest point) you introduce some sort of water break that will cause the water to drip down to the ground. There’s nothing worse than setting up the perfect shelter only to wake up with a wet bottom because you neglected to tie a drip-line! Staying dry makes all the difference between a happy trip and a less-than-happy trip. Make sure to also learn how to stay warm in your hammock. This entry was posted in How to, Informational, Materials, Staying Dry and tagged Camping, rain, shelter. Should You Take Your Hammock To Joshua Tree National Park? Wow! I’ve never BEEN in a hammock, and I sure feel like I’ve missed the boat. Now I’ll know exactly ‘how to’ if I ever get the chance! I love hammock camping. I still keep learning how to pith my tarp in a storm. Now i have something to try out when I go camping again.